When I wrote Nine Reasons I'm Afraid to Have a Baby, I was overwhelmed by the responses from both women in my same, non-mama boat, and from women who were mothers. 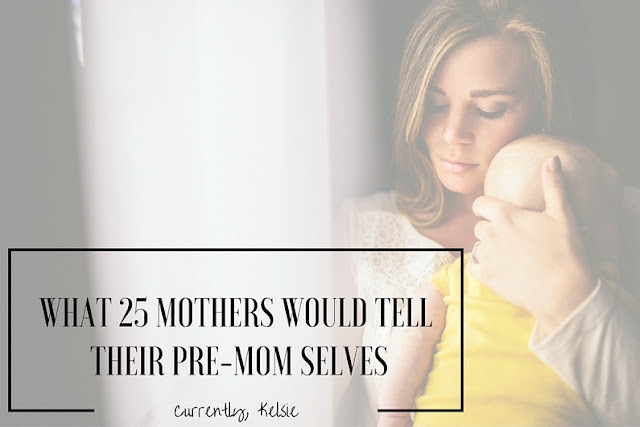 The mamas out there had some amazing truth and wisdom to share, which got me thinking: why not have them share what they would go back and tell themselves before they became a mom? I knew I'd be interested to see what they didn't expect or what they wish they'd known before, so I reached out to some blogging mamas, and this post was born! I wish I could have posted every single response, but I ran out of space. I'm so grateful for the honest words from these 25 amazing women, and am honored to be sharing them today for all women to read and benefit from! "Having a baby won't stop you from pursuing your passion. We have traveled to 15 countries in a year, and started when our baby was 6 months old. Having baby makes you more organized, multitasking, and a better person. Moreover you will love yourself more." "I would tell my pre-mom self to enjoy every phase while it's happening - not when you are looking back and remembering it. Also appreciate the differences in all of your children. I didn't realize how much it would hurt me when my kids were hurting or struggling with something. And lastly, parenting never ends - it changes as your kids grow older, but you will always feel responsible for them and want to be involved in their lives." "There is no such thing as perfection in mommy-hood. Do your best, love with everything you have, be present in the moment and you will do great! Just like any other role in life, you will have bad days and amazing days... Cling to the Lord and know you are doing a great job mama!" "With your first child you automatically get superhero powers! Two extra invisible hands, the ability to function on near no sleep, and the uncanny ability to "just know" things with no prior training!" "You are going to be so amazed at how much you can love and how unselfishly. Your world will change in one second and the everything looks different as soon as you hold that baby. Cherish the little things and be strong like I know you can be. Your wisdom surpasses your youth, darling, and you will be marvelous." "Accept help during the first few months, you need the sleep to repair your body, spirit and mind. The depression, anxiety and other mental health issues postpartum get better gradually and ease up around a year, they won't last forever." "You can never be fully prepared. We wanted a baby and we planned for a baby. I had younger siblings, I'd babysat, I had young nephews. I thought motherhood would be easier for me than it is for a lot of new moms, but it wasn't. When it's just mom, dad, and baby, in the trenches, you have to figure it out as you go. Google stuff, text your mom, crowd-source your questions on social media, but don't think you're alone in not having a clue what to do with a tiny baby. Just because you love and plan for that little person doesn't mean you're magically equipped with all the knowledge to be the perfect parent." "When I first looked down at my daughter, I loved her fiercely. Not because she had done something for me, or because we cultivated it together, but simply because she was, and she was mine. Becoming a parent has brought me greater understanding of God's love for me, which was a happy surprise." "Everything is a phase and none of it lasts forever...don't stress over suddenly sleepless nights. It could be teething and things will go back to how they were a week ago. Don't be afraid to do things. Going to the grocery store with my newborn scared me until I did it. Then you realize you can do anything! Bring your baby on airplane trips and to restaurants. They will know how to behave. Things won't always go as you planned...how you think you will deliver your baby or how you intended feeding him/her...just remember that healthy and happy is what's best." "I would tell my pre-mama be ready for the unexpected, because everything in life is unexpected. The things you're worried about probably aren't a issue, and the things that will be a issue you haven't even thought of. Enjoy each minute of this journey, or at least try to be present because soon every minute will just be a memory." "You are totally strong enough. You'll cry a lot, you'll feel like a failure quite often, things will never go as you plan-but you're strong enough. For the fostering, the adoptions, the sending kids back to biological parents, the pregnancies and the births. You are stronger than you know." ‪"Utilize the ultimate resource- God. Books and people will give you advice, some good-some not, but ultimately, any need, any want, any thing that comes to your children- take it to God. Don't be afraid to give Him the reins on a situation and trust His guidance. And know- that even the most seemingly perfect parents, make mistakes, have regrets and wish they could do certain things over." "I would tell my pre-mom self that everything will fall into place - even if it's not always neat and pretty. I was so afraid of figuring out what I'd have to let go of to make room for a child, and my priorities just adjusted naturally out of my love for her. I'd also tell myself not to fear childbirth -- it's more painful than I ever imagined, but it was also the very best day of my life. I felt like a superhero after giving birth!" "There's a possibility that you won't sleep for a very long time. You will at times get frustrated and want to rip your hair out. In those times, try to remind yourself that this is just a sign of how much this precious little one loves you." "Soak up the time with your first baby. No matter what life is throwing at you, no matter how stressed you are or how rough your circumstances are, that baby needs you and the closer you are to your baby in the beginning, the stronger your relationship will be through the rest of their years. Love them, squoosh them, kiss them, hold them, watch them sleep. Your house can be dirty, you can be unbathed for weeks. Love on that baby like there's no tomorrow while they are still tiny." "Cherish every moment you can get and do not worry about what other people say. Your baby is a gift from God that he gave specifically to you. He knew you would be the best mom for the job of raising your little one. So trust in him and do not worry over every little problem that comes up (and there will be many). But they will all pass and leave you with a beautiful child." "Don't wish it away. When the kids are up late at night and crying or throwing tantrums, or refusing to sleep for 15 months, all we want is for them to sleep, grow up a little, get out of that stage. We wish for it to be better, without realizing that we are also wishing away precious memories. So my advice would be to enjoy even the darkest of moments, because too soon they will be gone and you'll want them back." "I wish I would have known how much I would love my children, not only with the inherent unconditional love that came from their conception, but the growing love of who they are as people. How much I would love and value their little individual identities and how early those personalities would emerge! They are truly such fun little people!" "Enjoy the newborn phase. While you're in it, you are pulling your hair out and you think you'll never sleep again, but then as soon as it's over you'll want it back. So try to enjoy each moment as much as you can. And it's okay to let people help you. If you need a nap, call that friend who said she/he would watch the baby. Take care of you too!" "I would tell myself to stop worrying so much and to just enjoy my wonderful children. I also would tell myself that they would teach me more than I would ever be able to teach them." "There are really hard days, but it gets easier overall. You can still do what you love. Just give it time." "It is WAY more fun than "they" said it would be. I'm an aunt many times over and love my kiddos. But I didn't know that motherhood could be just as fun as my auntie days. Based on what I'd heard, I felt like it was going to be way more "him vs. us." I had a sense that I would just feel inconvenienced and constantly overwhelmed. But it's just not that way. (That's not to say it's perfect, or that I'm super well rested!) He doesn't feel "inconvenient" - he's just a member of the family with his own needs. And it's hard to remember what we did before he was with us." "The first few weeks/months I found I didn't need a big diaper bag when I went out with the baby. I started just carrying a few diapers, wipes, and burp cloths in my purse and that was more than enough for me. Freed me up so much since I didn't have to lug around a diaper bag!" 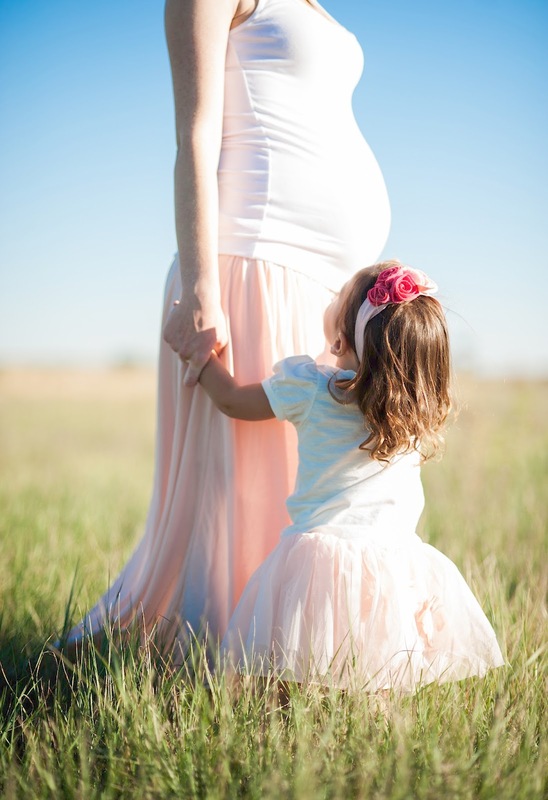 "Motherhood will challenge you in ways you never thought possible. But it will also help you grow to heights you never imagined. I struggled with postpartum depression with my third child and became a photographer as a result." "I wish someone told me how unnatural breastfeeding might feel and what to expect detail by detail, such as engorgement and leaking, before it actually happens! Coming from a family that did not breastfeed, I had no clue whatsoever that breastfeeding was going to be the biggest challenge I had ever faced." Wow! How amazing is all of this wisdom and heartfelt honesty from these women? Reading some of these was really eye-opening and some of them nearly made me cry. Pretty cool to see all these fabulous mamas out there totally rockin' it (no matter how old their kiddos are), despite the fact that they didn't really have it all figured out right away! I'm so thankful for their willingness to share with all of us. I hope this post gave you hope, made you think, or maybe just made you nod your head and say "yep" right along with all these awesome moms. I think that shared words and experiences are the best ways for us to learn and think, and I know I'm super grateful for the words of these women today! 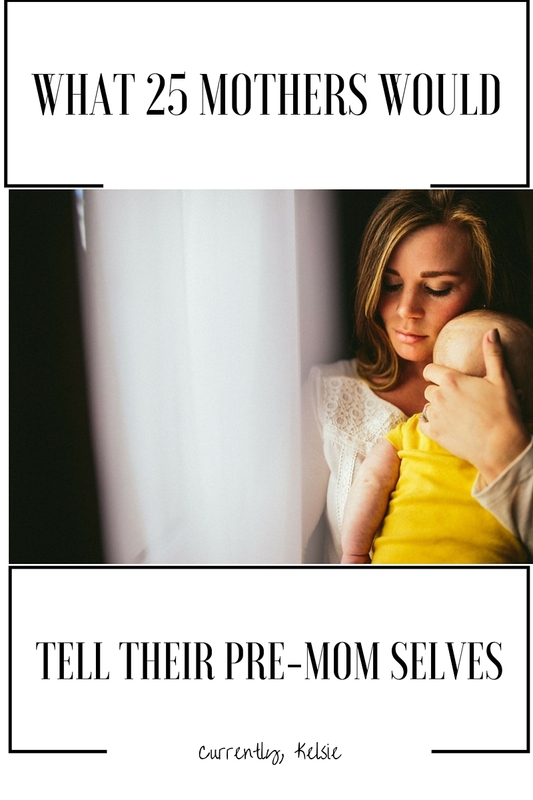 What would you tell your pre-mama self? I'd love for you to join in on the conversation in the comments below, or you can contact me privately here or on the Facebook page! You can also got check out all the blogs of my awesome mama friends in the links above. Come and join us! I love this so much. LOVE it. I think a big part of motherhood is this unspoken kinship you have with other moms, this, "None of us knew what we were doing, but look at us rocking this," feeling. I love that you're showing future moms that none of us really knew what we were getting into, but we're managing, and they will, too. This was a very interesting read and I hope it helps other pre moms and their family and friends to know how to help and what to do. Thanks for sharing this! I'm not a mom but if I ever do become one I'll remember things like this! It was great to read through how supermommys think about motherhood. Thanks for sharing! Love this read! You can never fully be prepared for a baby, but it can only change you for the better. Such a great post! I love the quotes! Love this! I definitely agree with the comment that everything is a phase and it's important to not to stress too much over things. Great read! Loving all of these answers! They're so different and diverse, proving that no mom is the same, no experience is the same and that there is no perfect way to do the most important job in the world! This was a fantastic read. I'm so glad I came across this! Great poet - definitely not quite what I expected but as someone about to have her first kid I liked it a lot. I love this! I don't have kids yet so I am in the same boat as you. I am saving this advice for when I need it. This was the perfect post for me! I'm expecting my first baby this October and I am so excited but still there is so much unknown. Even though we've been wanting a baby you don't really read up on everything beforehand to know what to really expect when your expecting and after you give birth and from all the mamas I know, there are so many differences between their experiences. I'll have to remember all these comments as I continue through the process! Gosh I teared up reading a lot of these!!! I am pregnant with my second and time has FLOWN by. Such a great post for new and experienced mommies! I love the "There is no such thing as perfection in mommy-hood" quote. My baby girl is due in July and already I feel immense pressure to be the 'perfect' mum. This is such a great post! I really want to be a mom someday but it's also terrifying! Ann from Kids Travel Books... thank you. I needed your comment more than anything today. Be present in the moment - that's great advice! I would say - Don't be afraid to ask for help! You'll do great! Trust your instincts. I wrote a similar post recently. I loved reading this. I am always curious about other mamas. Thanks for sharing. As someone who doesn't have kids yet, this means so much to me. Hearing so many women answer so honestly gave me so much insight into what motherhood will be like, what I should do beforehand, and what I shouldn't worry about NOT being able to do once we do have kids. Awesome post. This is great! I would of loved to have had a copy of these little bits of wisdom and encouragement when I was a new mom! My youngest is getting ready to graduate high school. If I could go back and tell my younger self something it would be "Listen to everyone that tells you to enjoy every moment and phase with your kids(even the not so good ones). It goes by faster than you think. And before you know it they will grown and gone." Looking back I realize how right they were! Where did the time go? All great tips for other non-mamas like me. This was beautiful and a much needed read for me. As someone expecting their first child I have so many fears and doubts and feel like I will never be prepared! It's helpful to hear from other mommas and bloggers I trust that they feel the same and just wish they had soaked up every minute they could. Thanks for sharing! I’m so glad you wrote this post! I’m sure it will encourage so many moms and pre-moms! It’s so easy to get caught up in the stress and craziness of those first few months, and this is a great reminder to slow down and live these days intentionally. Thanks for including my words too! I see me! I love these pieces of advice and I'm checking out the moms who gave comments! Great Post! Very encouraging I am glad I could be a part of one of the 25. These are some great and inspirational advice from moms! Thanks so much for compiling these and sharing it with us, Kelise. If I could tell my pre-mom self it's that nothing is permanent in parenting. The exhaustion, the sleep deprivation, the little years, the teenage angst--they'll all evolve into something different, bigger, more challenging, but also more satisfying and rewarding. The important thing to remember is to be present while all of it is happening. Don't wish for the next thing. Just enjoy the current phase and ease into the transition of change. It's the most constant you'll have as a parent. What an awesome post filled with great advice. I have to keep this in mind for myself since I am sure I will become a parent over the next 5 or so years. I'm honestly sitting here bawling. I've felt like such a failure as a mom lately, and so depressed and out of sorts, and reading all these help me to remember what the heck it is I'm working so hard for. I needed to read this so badly. Thank you, thank you, thank you. Oh my gosh, these are great! I am posting it for the soon-to-be moms in my 'young marrieds' sunday school FB group I am in! So much wisdom in these reposes! So interesting! I don't have kids of my own, but I have 8 nieces and nephews and a few of my close friends have started having kids. I've been lucky to have friends who are honest and open with me about their realities with having babies. Yes! I think they touched on everything I would have told myself before I became a mom! I love this! As we prep for one day starting our family it is so much fun to read everything from the mommies out their. I have been looking for some great mommy blogs and this has given me some to try out! I love how universal these thoughts are from mom to mom. Thanks for adding me to this list! I just saw this. Silly me! Oh my goodness this list is amazing and oh so on point. I would tell my pre-mom self to make sure to remember that self-care and maintenance is just as important for me as taking care of a child. Love your post! So much yes to all of this! My biggest thing is to appreciate all the little moments, it all goes by so fast! I would tell pre mom Taylor to let people help her and try not to do everything alone. I'd tell her that it's going to be hard and she's going to cry a lot and that's okay. I'd tell her you will want to run and never come back and sometimes you may not like your baby even though you love him - but that's okay and doesn't make you a bad person. Just a normal post partum mommy. I'd also tell her to stay off Facebook for a while - I promise your friend's first two weeks with her baby wasn't "the best two weeks of her life" like she claims it was. But above all I'd tell her that her life will be more beautiful and more challenging than she ever thought possible. That after having a child she might start to have a better understanding of Christ's love for all of us and how powerful that love really is. Just a few things. Lovely post! This is such a great idea for a post! I found myself nodding the whole way through! If I could tell my pre-mom self anything, I'd definitely tell her that time goes by so fast. Faster than you can imagine and it keeps going faster the more kids you have. So enjoy the fun and not-so-fun stages your kids go through because they really don't last long. I'm literally over here crying because of how beautiful everyone's responses are. I sure hope that when the time comes for us to have kids down the road, I get those two invisible extra hands and superpowers...it sounds terrifying but oh so beautiful.